The ears of the show organizers for the upcoming Connect Mobile Innovation Summit must have been ringing when planning their speaking agenda. Connect, set for August 17th-19th in Chicago, focuses on the mobile payment landscape within the retail and restaurant industries. Bluefin Chief Innovation Officer Ruston Miles will moderate the “Come Together: Aligning Marketing & IT for Mutual Success” panel. Panelists from Sears Holding Company, Office Depot, Papa Murphy’s and Taco John’s / Lawrence & Schiller will discuss how mobile is transcending all channels. Marketing and Technology (IT) – two very diverse departments within any business organization. Both are chalk-full of talent and skills, and often are the driving force in successful business operations. While Marketing brings the vision and strategic plans to life, IT provides the infrastructure necessary to accomplish both. These two departments often compete against each other to promote their own agenda as well as secure their share of budget money. Barriers such as miscommunication, different perspectives, politics and competition can get in the way of Marketing and Technology working successfully together, but companies are finding that in today’s market climate, synergy between the two departments are necessary, and in fact, directly affect the bottom line. Biz journal highlights the potential impact Marketing and IT departments have when working cohesively to formulate good business strategy. Customer analysis – Capture customer trends and behavior, and apply data to marketing strategies. Personalization – Develop online and offline marketing communication directly targeted to individual customers. Customer feedback – Design effective online surveys to gather important customer feedback. Community building – Develop and enthusiastic community of customers around their products and services. Customer relationship management – Assess and integrate the right tools for your organization and customers. Affiliate marketing – Create a network of websites and customers who resell products and services. Communication – Develop and implement previously untapped channels. Permission-based marketing – Build a clean “opt-in” list of interested customers and prospects who want to hear the company’s message. On August 19th, Bluefin will moderate the COME TOGETHER: ALIGNING MARKETING & IT FOR MUTUAL SUCCESS at the Connect Mobile Innovation Summit. Connect will feature the leaders in the mobile payments space, while showcasing best-in-class examples and highlighting where mobile might be headed in the future as well as long term. Their closing panel focuses on Marketing and IT Cohesion. Panel members come from both sides of the Marketing or IT fence, and will discuss scenarios within their respective companies that called for the two departments to come together. Whether it be a product strategy shift, a new process implementation, or the vision to see a better rate of success, all panel members will discuss how coordination between Marketing and IT is vital to their business. In a prep discussion for the upcoming panel, it was clear that all panel members saw the importance of working together. One of the examples a panel member talked about was how his company kicked off an ecommerce platform, and in order to ensure the right architecture was in place and to deliver the right experience to their customer, the Marketing and IT departments worked hand-in-hand to build synergy and provide a good team approach. So it’s obvious that synergy between departments is good for business. But what can organizations do to bust through barriers and bring Marketing and IT together? Companies may consider organizing meetings to bring employees from both departments together to educate each other on their perspectives, creating an open door environment that allows the organization to explore ways it can guild technology-driven solutions that generate new business. Additionally, it is important for both parties to establish clear objectives in a way the will engage them in supporting each other. With strong leadership and continued communication between departments, all employees will come to understand the increased power and effectiveness working together will bring. 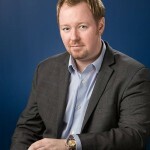 Ruston Miles speaks at various technology and security-focused shows across the country, and is the founder of Bluefin. Bluefin’s mobile payment solution, QuickSwipe, provides secure mobile payment solutions, all backed by the first North American PCI-Validated Point-to-Point Encryption (P2PE).